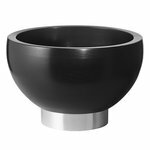 SGJ bowl by Georg Jensen charms with a combination of black-coated ash and mirror-polished stainless steel. The bowl is a fine example of Søren Georg Jensen’s simple, sculptural and organic style. SGJ bowl makes a timelessly beautiful decorative piece and can be used for storing small items or serving fruits and sweets.